The jury is still out on whether submitting a sitemap to Google makes a spit of difference to your rankings or not, but it would still appear that it does no harm. The problem has always been that downloading the Google software to generate a XML sitemap is a bit of a tech nightmare, and definately out of reach of most folk. I've found a great website that will quickly spider your site and generate a XML sitemap to Google's specifications. Just pop in your URL, wait a bit then copy the generated sitemap and copy it into notepad, then save it as sitemap.xml and upload it to your website. From there you just need to know the URL of your sitemap through thier webmaster tools site. This one comes direct from Microsoft! A user just called me saying that some of his folders in Outlook had 'dissapeared'. I gently asked if he may have accidentily dragged and dropped them off somewhere and he assured me he had searched each of his folders and couldn't find them. My first instinct was to restore the folders from the backup that ran automatically the night before, unfortunetly this is when I found out there was a problem with backups and this route to a solution wasn't possible! A search on both Outlook and Google Desktop showed that the messages still existed somewhere, but in a location we just couldn't find. I closed outlook and went into task manager to esure the process had also stopped. I then launched Outlook by going to the start button, then choosing run and entering Outlook /resetfolders When Outlook opened up the missing folders had returned. This user uses POP3 mail stored in a PST, that PST is stored on a network location. Some of my users at one of my clients were reporting that Outlook 2003 was showing numbers of messages sending when they could see nothing in their inboxes. For example when they hit 'Send and Receive' the status bar in Outlook would say 'Sending message 1 of 7' even although the outbox was empty and they didn't have any trouble sending emails to anyone. It turns out these invisible messages don't live in the outbox at all, in fact they're not even real email messages! The mystery failed emails turned out to be 'read receipts', generated by third parties (the senders) requesting read receipts when sending mail to my users. These failed read receipts don't live in any folder that can be viewed normally, they sort of live in the very root of your personal folders, the 'Outlook Today' page that is seen when you select the name of your personal folder in your folder tree. Download this rather cool but of software called 'Outlook Spy' - http://www.outlookspy.com/ it's totally free and blows everything Outlook tries to hide wide open! When Outlook Spy is installed open Outlook and click once on the root of your personal folders/ mailbox so you see the 'Outlook Today' page. You'll notice that there's a new toolbar visible in Outlook with all kinds of tempting looking buttons on it. Click the IMsgStore button on the Outlook Spy toolbar. On the next dialogue box 'GetContents Table' tab (it looks like a button and it on the top row). In the left hand pane of this new window you'll be able to see the mystery stuck emails/ read receipts. One by one open up each of the messages and on the new window that pops up choose the 'IMsgStore::Abort Submit' button, a message will pop up telling you the message has been deleted, close the window and move onto the next message until they are all gone. Don't be alarmed if you get an error and the message doesn't disappear, you can also fairly brutally just delete all of these messages from the screen that initially shows you them (see point above) but I wouldn't recommend it. Outlook Spy isn't a terribly user friendly bit of gear, you may find you have to keep going into it and coming out of it to remove all the mystery messages, but you will get there in the end! To save your self from users that suffer from 'Red Button Syndrome' it's well worth hiding this toolbar from them by deactivating it in the 'view, toolbars' menu in Outlook. Nuts, I think I've broken something else! 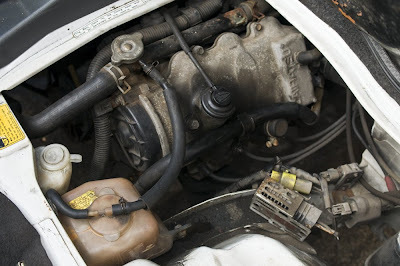 The temperature guage in our Daihatsu Hi-Jet isn't functioning at the moment so I thought I'd better check the coolant levels are ok. Not as easy as I first though, thankfully some nice people on the Daihatsu UK forum helped me identify the bits I need to check. 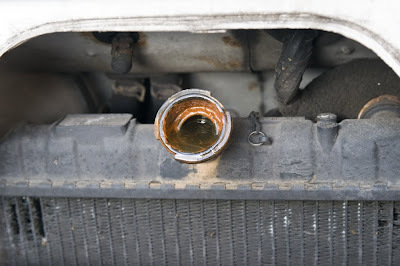 In the photo above the coolant reservoir is the rusty coloured bottle with the tubes running through the cap in the bottom left of the photo. It's rusty coloured because, well, the coolant in there is a thick rusty sludge. I'll add flushing the coolant system to my list of things to do I guess! 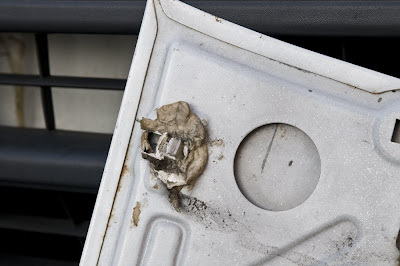 Instead of the panel that hides the radiator on the front of the van being a plastic flip down panel as I expected it was in fact a clip on metal panel that someone had glued shut using what looks like chewing gum, but I'm sure it isn't. I didn't taste it, honest. Further confusion when I took off the radiator cap, it looks fine but I can't be sure! Maybe this is why previous owners had only checked under the passenger seat? Now I'm stuck with the problem that I've got nothing hiding the radiator and I live on a busy street! Eeek, I'm going to have to fix this quickly! My mate Dave came round and agreed, it's a bit of a pickle! 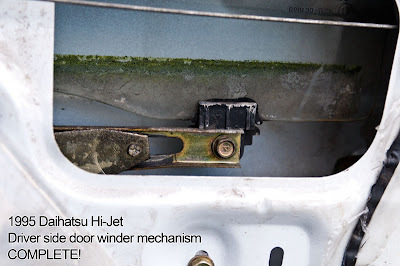 Luckily I managed to find a new Daihatsu Hi-jet winder mechanism to the replace the mangled one in the door, it was only fifteen quid and came from a hi-jet roughly the same age as mine. 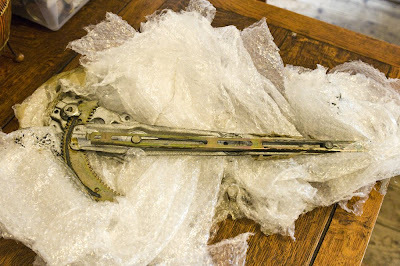 It does look a bit like a part from a bionic leg though! 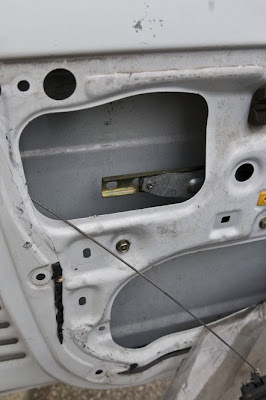 So off with the door panel again, this time I needed to unscrew the door release as well as the internal handle. It's the door release handle hanging now on what looks like a length of wire. The plastic was covering the inside of the door, no chance that's ever going to be quite the same now! Then I noticed something I didn't see the last time I was fishing around inside this door, a lump of wood! 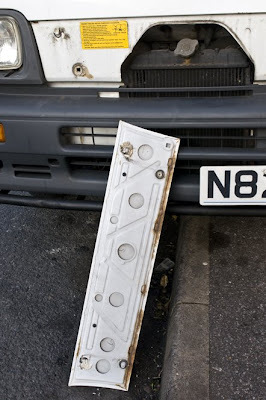 I've seen this before, the winder broke on a Vauxhall Nova I had years ago and I shoved in a lump of wood to jam the window shut, otherwise the window fell open all the time, especially if it was raining really hard on a motorway! And in the photo below you can see what happened when I pulled the bit of wood out! Thankfully the old winder mechanism came out really easily. I was surprised to find out the bolts were 10mm, it's amazing how much stuff on each of the cars I've owned can be dismantled with a single 10mm spanner! 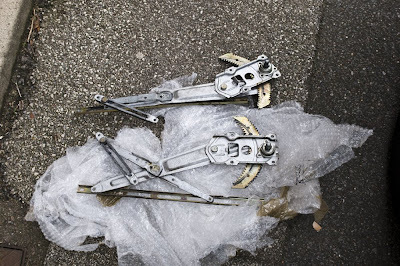 In the photo below the top winder is the bent and broken one, the bottom mechanism is the ebay jobbie. So the window winder mechanism went in without any trouble, but for some reason it only winds halfway up the door, I can't for the life of me figure out why. This is clearly no good at all for closing the window. I had my wife stick her hand in the door cavity and she managed to dig out the small plastic doings that attach the window to the winder mechanism. It was this bit that was the bit I was really worried about having to replace, it's tough ordering parts if you've got no idea what they're called! 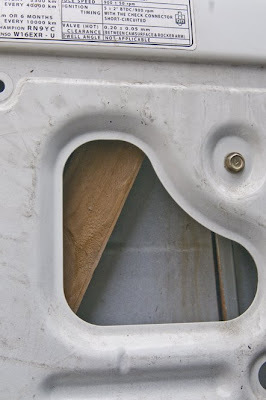 I compared this door to the working drivers door window winder, and it really shouldn't wind all the way to the bottom of the door cavity as it does in the photo below. Well I guess I've got the parts now so I might go see if our friendly local garage and help me out! At least I tried! Whilst eating a sandwich shortly after this adventure in failure my wife asked why I didn't just replace the entire door. Arg, why didn't I think of that! I didn't just marry her for her looks ya know! I've only owned my Daihatsu Hi-Jet for a few days, and I bought it largely as a reaction to owning modern cars that I couldn't fix myself, like my Honda Aerodeck. The car this Hi-Jet is replacing is my Mondeo Zetec S, going from 2.5l V6 petrol to the 993cc Hi-Jet has been quite a leap! The first saving was road tax, a years road tax for our little van is less than six months tax for the Mondeo, considerably less! I don' t know if my hi-jet is older than the one mentioned on the forum, but I found none of the foam and waterproofing I was expecting! Mind you, simple is fine by me! 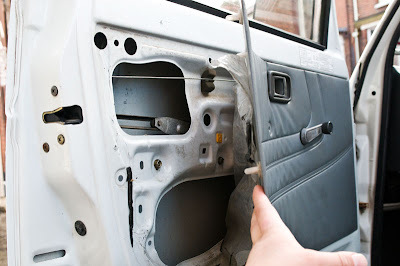 After removing the door handle it was really easy to pull the door card off with my fingers and peer into the door. I'm quite impressed with the amount of space inside the door, maybe I can have some door mounted stereo speakers after all! 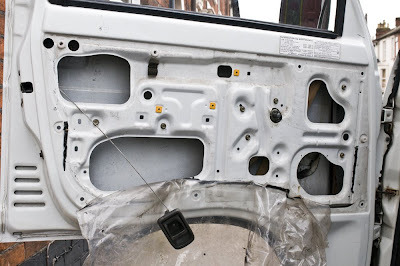 Next stage was to open the panel on the drivers side door and compare one to the other. As you can see from the photos above, the window is no longer attached to the top 'rung' of the winder mechanism. 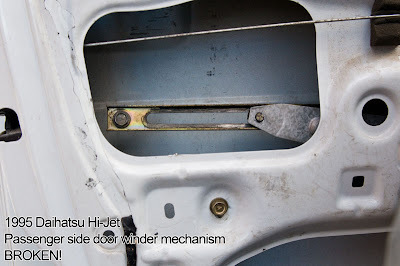 The question is, where is the fixing bolt that is evident in the driver side winder mechanism? I fished around in the bottom of inside of the door and crammed my hand into the gap at the top of the door cavity and still couldn't find the bolt! The window appears to be jammed in the closed position, which I suppose is better than it being open all the time, but it doesn't half get hot in this little vans so a window that opens would be far preferable! It was worth opening the drivers door, I found out that one of the runners that guide the window down the inside of the door had rusted and buckled and was causing the window to open at a really awkward angle. I've pulled this dodgy runner out and chucked it. I suppose I probably ought to replace it though, in the short term I've warned the wife to be careful opening the window! will do the same job. As you can see from these photos, the window is no longer attached to the top 'rung' of the winder mechanism. 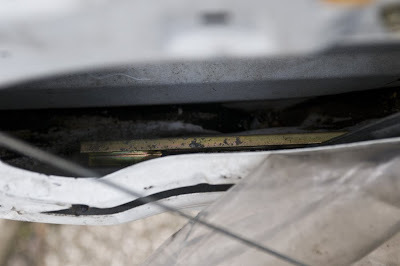 The question is, where is the fixing bolt that is evident in the driver side winder mechanism? I fished around in the bottom of inside of the door and crammed my hand into the gap at the top of the door cavity and still couldn't find the bolt! The window appears to be jammed in the closed position, which I suppose is better than it being open all the time, but it doesn't half get hot in this little vans so a window that opens would be far preferable! It was worth opening the drivers door, I found out that one of the runners that guide the window down the inside of the door had rusted and buckled and was causing the window to open at a really awkward angle. I've pulled this dodgy runner out and chucked it. 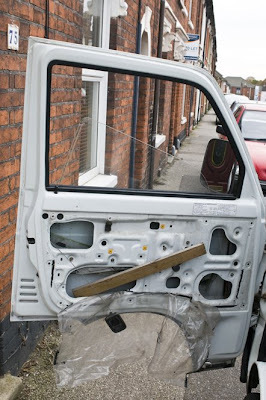 I suppose I probably ought to replace it though, in the short term I've warned the wife to be careful opening the window! So the next step is figuring out how to free up the window, and then seeing if I can find one of the wee widgets that fixed the top rung of the winder to the bottom of the window, or at least something that will do the same job. So here we go again, much like when I ran it before this blog won't have much of a particular theme, it will be a sort of dumping ground for the kind of stuff I put on the original lawsie.com website. I killed the original lawsie.com site a long time ago as it had reached around 2000 pages and was totally unamanageable, the new lawsie.com site has a lot less content but it's still so much easier to post to a blog than a website, the navigation is automatic, it's also found easily by search engines. I intend to put some of the very old content on this blog now as a way of archiving. Anyway, enough of my rambling, on with the show!